Lambert et al. to attend. 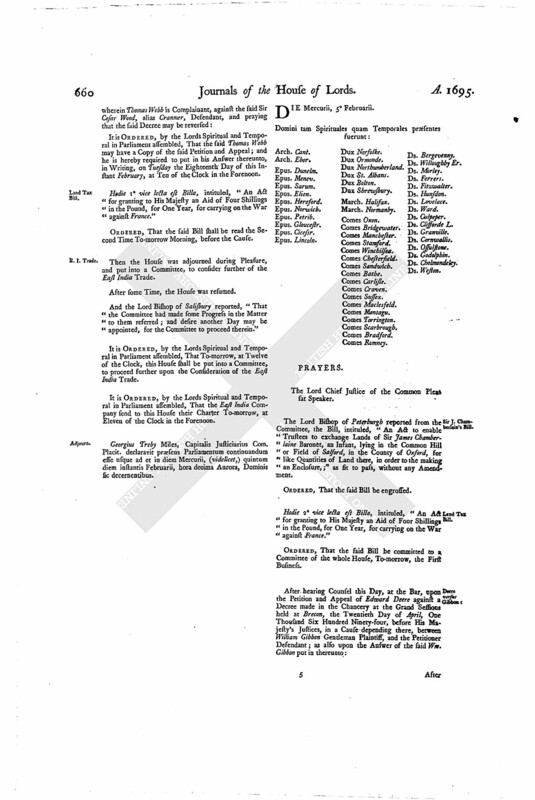 The Lord Bishop of Peterburgh reported from the Committee, the Bill, intituled, "An Act to enable Trustees to exchange Lands of Sir James Chamberlaine Baronet, an Infant, lying in the Common Hill or Field of Salford, in the County of Oxford, for like Quantities of Land there, in order to the making an Enclosure,;" as fit to pass, without any Amendment. Hodie 2a vice lecta est Billa, intituled, "An Act for granting to His Majesty an Aid of Four Shillings in the Pound, for One Year, for carrying on the War against France." ORDERED, That the said Bill be committed to a Committee of the whole House, To-morrow, the First Business. 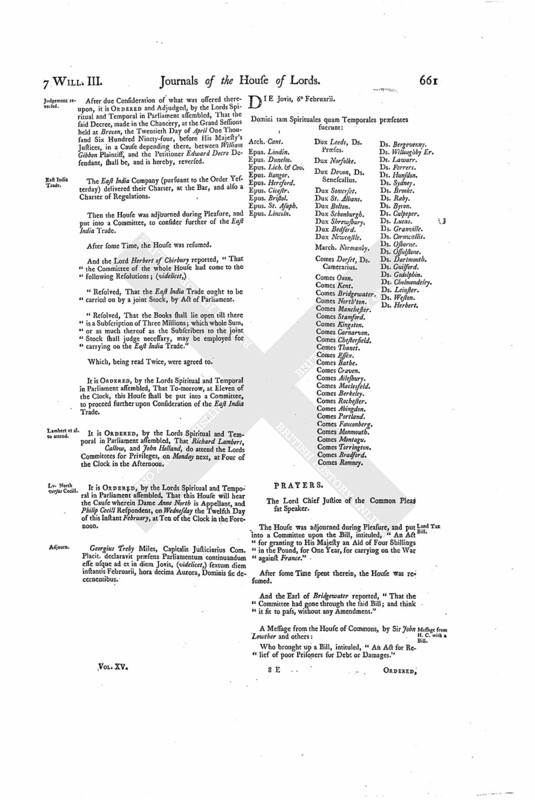 After due Consideration of what was offered thereupon, it is ORDERED and Adjudged, by the Lords Spiritual and Temporal in Parliament assembled, That the said Decree, made in the Chancery, at the Grand Sessions held at Brecon, the Twentieth Day of April One Thousand Six Hundred Ninety-four, before His Majesty's Justices, in a Cause depending there, between William Gibbon Plaintiff, and the Petitioner Edward Decre Defendant, shall be, and is hereby, reversed. The East India Company (pursuant to the Order Yesterday) delivered their Charter, at the Bar, and also a Charter of Regulations. Then the House was adjourned during Pleasure, and put into a Committee, to consider further of the East India Trade. "Resolved, That the East India Trade ought to be carried on by a joint Stock, by Act of Parliament. "Resolved, That the Books shall lie open till there is a Subscription of Three Millions; which whole Sum, or as much thereof as the Subscribers to the joint Stock shall judge necessary, may be employed for carrying on the East India Trade." It is ORDERED, by the Lords Spiritual and Temporal in Parliament assembled, That To-morrow, at Eleven of the Clock, this House shall be put into a Committee, to proceed further upon Consideration of the East India Trade. It is ORDERED, by the Lords Spiritual and Temporal in Parliament assembled, That Richard Lambert, Callow, and John Holland, do attend the Lords Committees for Privileges, on Monday next, at Four of the Clock in the Afternoon. It is ORDERED, by the Lords Spiritual and Temporal in Parliament assembled, That this House will hear the Cause wherein Dame Anne North is Appellant, and Philip Cecill Respondent, on Wednesday the Twelfth Day of this Instant February, at Ten of the Clock in the Forenoon. Georgius Treby Miles, Capitalis Justiciarius Com. Placit. declaravit præsens Parliamentum continuandum esse usque ad et in diem Jovis, (videlicet,) sextum diem instantis Februarii, hora decima Aurora, Dominis sic decernentibus.